I just wrapped up a week in Norway with my mom and one of my sisters. Pretty much a perfect fall vacation--weather was great, scenery was spectacular, and we are all still speaking to each other. For non-food Norway pictures, see this album. I've thought about posting food thoughts, whether to do an uber-mega post of everything, or break it down by meal, but the best compromise seems to be to recap by city. 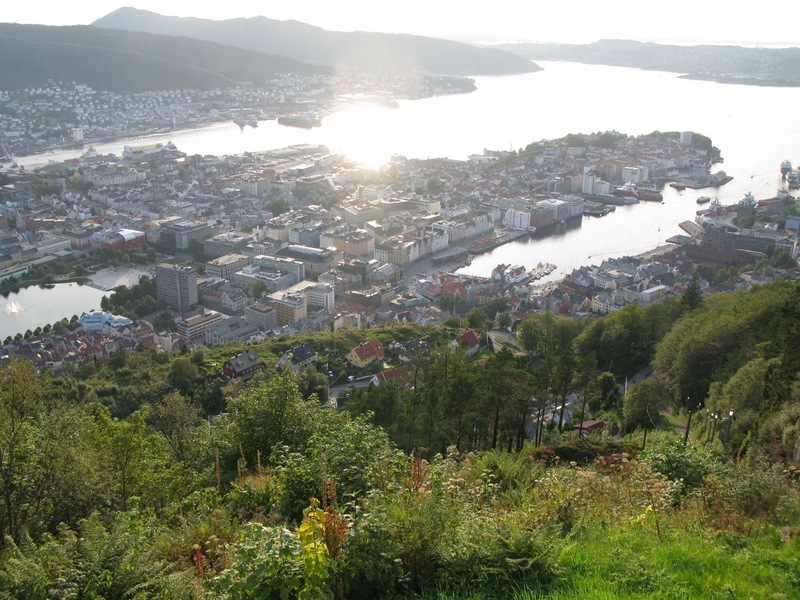 In reverse order, here's Bergen, where we had two dinners. 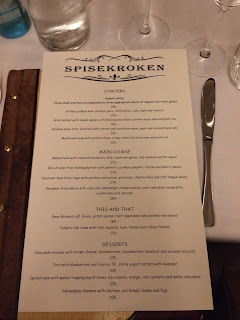 One dinner was planned and fancy, at a place called Spisekroken. It's a pretty typical locovore/seasonal-type contemporary place. But it's Norway. I had smoked duck with carrot and buckthorn puree followed by lamb with pearled barley, pickled pumpkin, thyme, and sherry sauce. 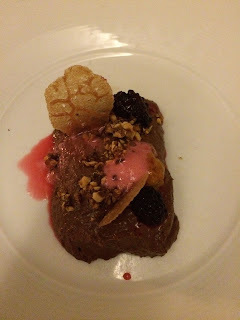 And for dessert we shared a chocolate mousse with Norwegian brown cheese and blackberries, cloudberries, and hazelnut and caramel. 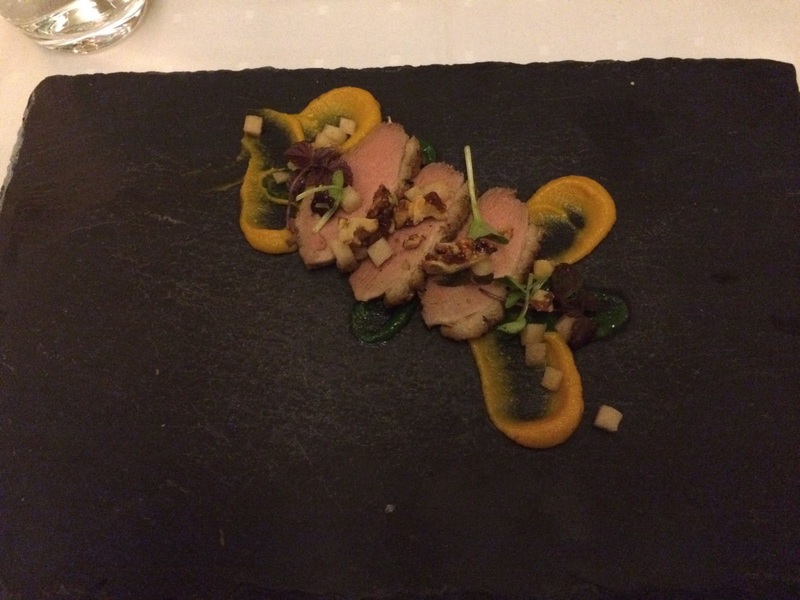 It was a nice meal--service was good, the space is nice and contemporary, and the duck was excellent. 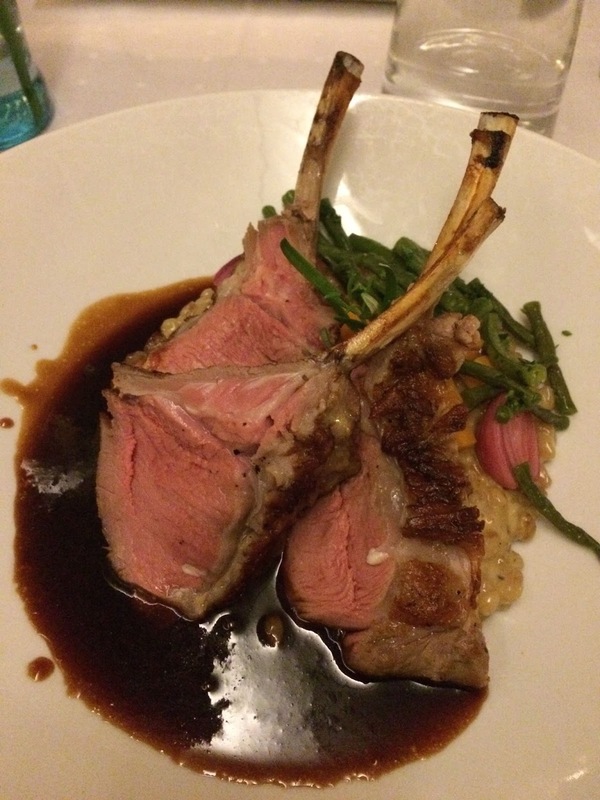 I've had better lamb chops; these were a little fatty. Nice job with the sauce, though, and I loved the grain. I never think to make barley. I should. Something clearly went wrong with the dessert--I think they got busy and it sat a while. It looks suspiciously like a melted lamb chop, no? Thankfully, it tasted a lot better than it looked. 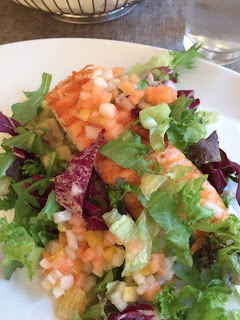 The second, much less fancy, dinner was at the Opera Cafe. 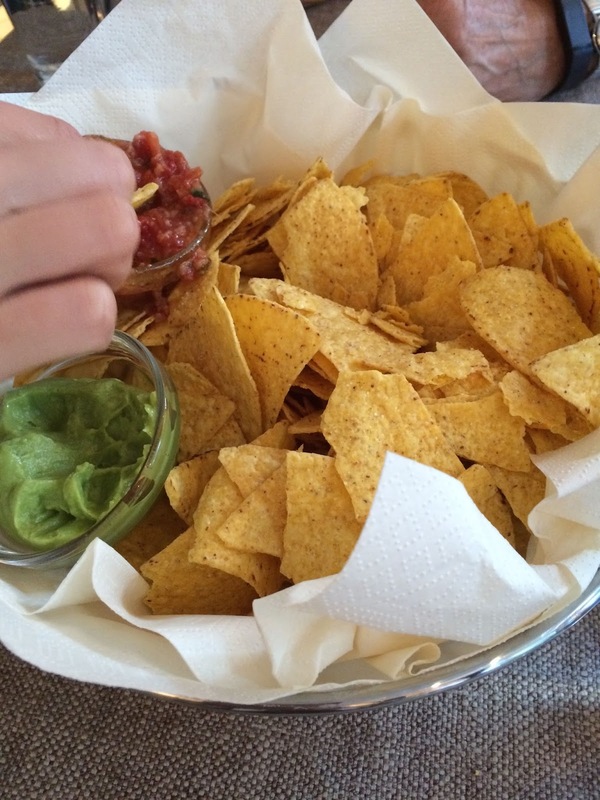 Yes, chips and salsa. I liked it since it echoed mom and my first meal of the vacation. Then I had simple grilled salmon, with a nice fruity salsa and, joy of joys, a salad. And we shared a piece of tremendously good eplecake and ice cream for dessert. This was unplanned--I hadn't made a reservation for the last night. We were out, we were hungry, I was getting grumpy, and Google Maps turned it up nearby. 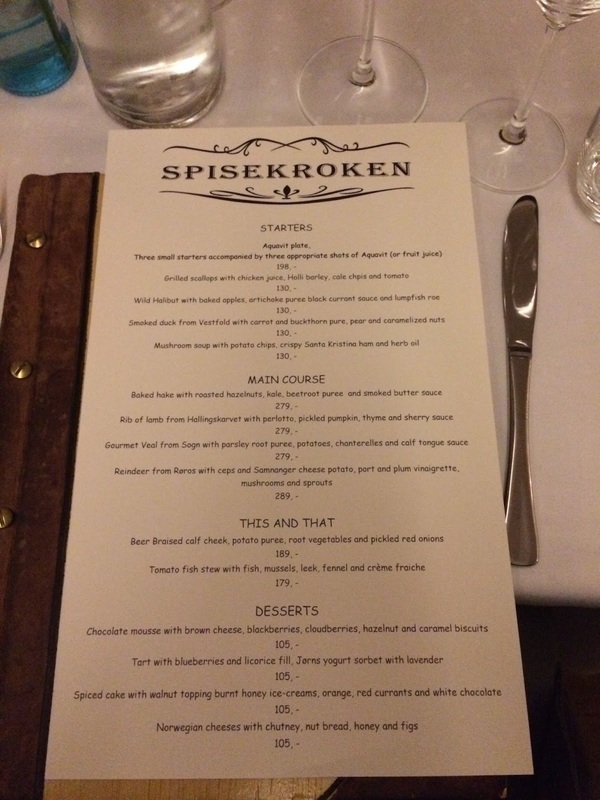 But it was perfect--definitely more the way Bergenites eat every night than Spisekroken. And we needed something lighter and simpler. I loved the vibe, too--it was right by the national theater, and close to the university, so very studenty and low-key. Mom and I had some prosecco and toasted our last night in Norway. 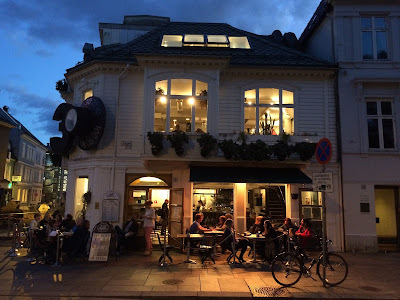 A couple of other notes on Bergen eats. As I'm easily persuaded by advertising, I had a Skillingsbolle from Baker Brun, the "all-time favourite Bergen treat." 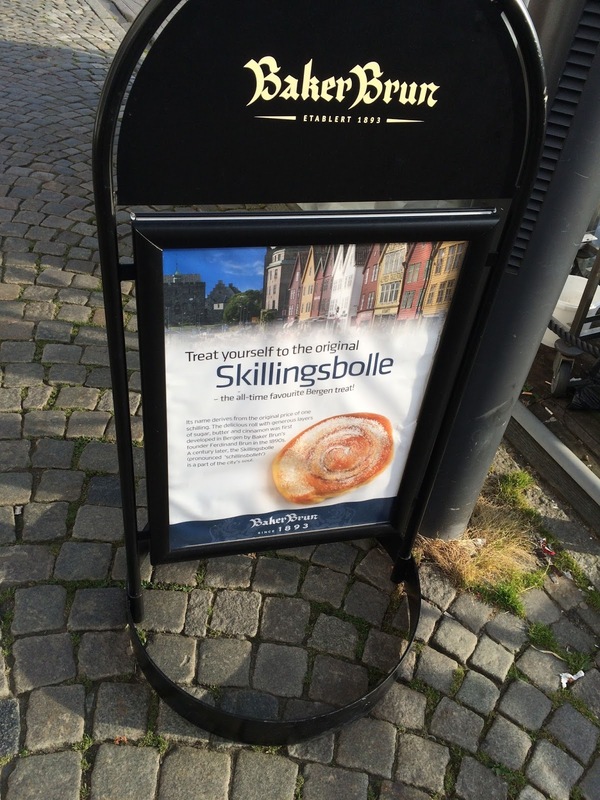 It's a cinnamon bun, but one that's been a Bergen tradition since the 1890s and "a taste of the soul of the city." So they must be doing something right! 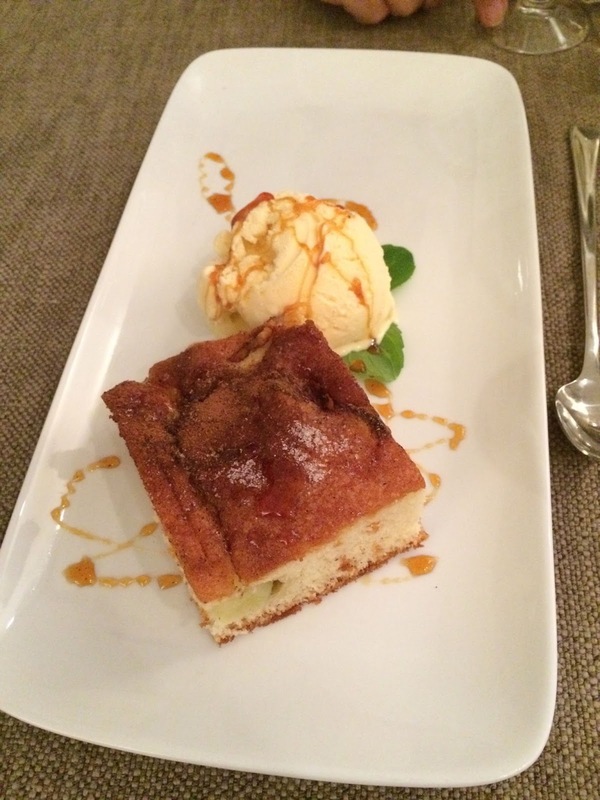 And maybe one of the best things I ate all trip. 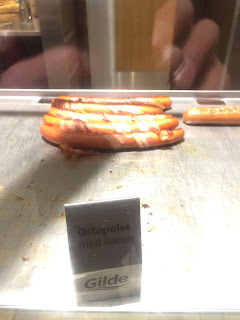 During our couple of hours touring the Sognefjord's spectacular scenery (all mountains, sea, and waterfalls), I had an Ostepolse med bacon--a pork sausage studded with little chunks of cheese, wrapped in bacon, and cooked in the ferry's little snack bar. Served a la hot dog, in a bun with mustard. In the moment, brisk air, breathtaking scenery, amazing adventure, it was pretty much the ideal thing to be eating. Thanks, mom!